Yoga demands no introduction as it's known and practiced world-over. It's a set of Asanas (special exercises) helping you to keep fit and have a peaceful mind and healthy body. Yoga should be practiced in a very systematic manner for maximum benefit to mind and body. As it has multiple effects on the body, stressful life is forcing us to try Yoga. Positive results have made it popular world over. 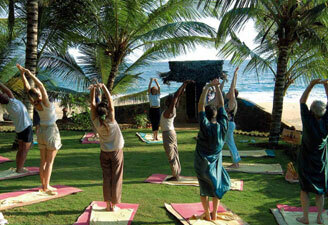 Yoga has emerged as one of the most favourite themes of tour packages in India. Yoga helps curing various diseases and disorders. A number of postures and breathing techniques have been prescribed in Yoga to cure almost all diseases, health disorders, pains and allergies etc. Most of these exercises are very simple that have a magical effect on the body. Yoga was initially conceptualized in Indo-Nepal region thousands of years ago. It then evolved and included various postures. These postures actually fine tune the body and prevent it from a number of ailments. Ultimately these postures bring composure in your personality. After persistent efforts, many of the people have mastered these postures and attained higher level of well-being. Interestingly, all martial arts including Kung Fu, Karate and Ju Jitsu etc. have evolved from yoga. Yoga's oldest formal references date back to around 200 B.C. (Patanjali's Yoga Sutra), although there are a number of references that hint even earlier origin (Vedic period or 2000-3000 B.C.). The word yoga means is derived from the verbal root, yuj, meaning to yoke, harness. Therefore yoga can be understood as the process of uniting ourselves in order to express the energy of our true nature. It also can be understood as the methodical steps of aligning and converging our body, mind and spirit for the purpose of enlightenment. Ultimate reality of life has always been a prime concern for Indians. That's why they have been linking almost every possible sphere of life with self-actualization, their goal of life. They believe that the root crisis of the human spirit is the separation of man's spirit from supreme consciousness. This separation begins with the ignorance of our birth, and results in sufferings of physical, emotional and psychological conflicts. Major consequence of this disconnection and loss of this awareness culminates into our search of happiness from the outer world, not in ourselves. Approval and value judgments of others, the material and sensory pleasures of life and the more is better philosophy are the off-shoots of this description. We drift towards anything that allows us to forget the cause of all our suffering lying within. Yoga eliminates the distractions and brings back us to ourselves. The process helps us to recollect and reunite us with the innermost centre of our being. 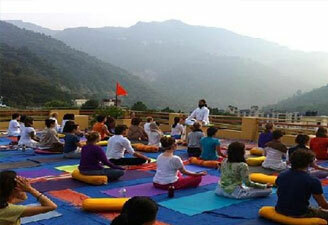 The premier centre of yoga in Yoga is located in Rishikesh. A number of ashrams here offer courses on meditation, yoga and Hindu philosophy. Sri Ved Niketan Ashram organizes the hatha yoga and pranayama meditation classes. Another ashram named as Shivananda Ashram is located opposite Shivananda Jhula and flocked by tourists. If you want to stay in the ashram, you are required to intimate the authorities a month earlier. 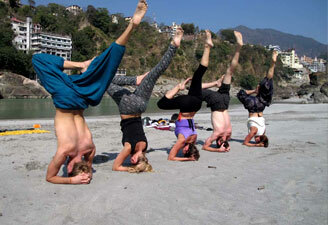 Yoga Niketan Ashram, Omkarananda Ashram, Vanmali Gita Yogashram, Dayananda Vedanta Ashram, Brahma Niwas and Yoga Study Center are other ashrams in Rishikesh. UP Tourism organizes International Yoga Festival every year from 2 to 7 February. Other destinations in Yoga are scattered in almost every nook and corner of the country, and specially in Kerala.